Today I went to a brunch/play date that T was hosting at the community center. I went early to help her set up and make some food, and we chitchatted for a bit and made plans for tomorrow. I shall be incredibly busy tomorrow if all of our plans go... well, as planned. First, we will go to Ikea to pick up the items that should be back in stock, as well as picking up the wardrobe that Michael and I couldn't fit in the car last week. Then, we will go on a lunch date somewhere. We haven't decided where yet, but we'll figure it out. After that, we're going to go to Insa-dong again! To the arts & crafts store! Yay! Last night I spent some time chopping up some wax. I've noticed that I reach for wax that I don't have to immediately cut over other wax that I know is too big to currently melt. To fix that, I went through a huge chunk of my stash and chopped it down to melt-able pieces. Hopefully that will get me back into melting. I'm that way too with wax. I'll shove aside anything I have to cut and reach for something smaller, even if the scents I'm really craving are in larger form. I rarely cut as I need it. I usually end up chopping all that needs to be chopped in one frustrated sitting. It sure does look dead! The way taming works in Ark is you have to knock out a dino, then feed it food while it's asleep until it magically wakes up and is tamed. LOL There are a few 'passive' tames that you have to run after and feed and eventually they'll tame, but right now most of them is the... uh... looking dead variety. In one frustrated sitting. Yes! I didn't even cut as much as I wanted to this time because I grew discouraged at how much chopping I had to do. Then some of the wax would fall apart or crumble, or the blade would cool down and I'd need to put it back in some warm water, or the wax chunk was large enough that I thought it needed to go into the microwave for a bit for easy cutting. Lots of trouble. That's why I like CFTKR! All of her chunks are small enough that I feel comfortable just popping one into a warmer. Wow, your cutting is way more involved than mine. I never thought to warm the knife of the wax. I just hack it and if it crumbles I weigh out 1 oz. portions and put it in little baggies. I tried just hacking at my wax and I got super annoyed at the crumbles. After reading some posts in some wax groups about their methods of cutting I decided it would be worth it to heat up the knife and/or wax. I like the cuts. They look cleaner and I can get chunks that are more uniform in weight. 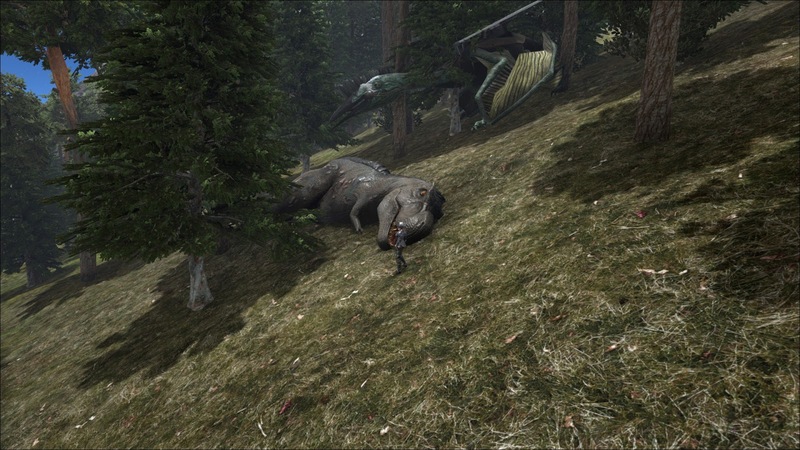 Hmmm... On my singleplayer game I only have about 15 dead dinos :P On the server I used to play on with my dad and mom before we let everything die off we had over 100 dead dinos. LOL There is a server wide limit of... I want to say 5000 tamed dinos? It's an adjustable setting anyway. Different dinos can have different purposes. Basically dinos are better than humans in almost every way. Higher carry weights, they can gather building materials more efficiently than humans, and the ones you use to hunt are good at hunting. Not to mention all of the different flying dinos you can have. My favorite is a Quetzalcoatlus, which is a ginormous flying bird that can carry a lot, is very tanky, does a fair amount of damage, and you can build a base on it if you make the correct kind of saddle. OH! And you can breed almost all of the dinos and get adorable baby dinos that grow in real time and eat a ridiculous amount of food. I had lots of fun with that mechanic when it first came out. Can you tell I have a lot of playtime in this game and have followed its development very closely? "Can you tell I have a lot of playtime in this game and have followed its development very closely?" That's cool though. I wish I could get back into gaming like that. We used to be like that with UO, knew everything about every little bit of the game and were always up on news and rumors and everything. I MISS THOSE DAYS!!!! Oh man, I remember going back through old UO patch notes and seeing some patches and saying "I remember that day!" or "Oh man, I forgot how much of a pain that used to be." Like looting your bodies in the old days... *casts invis* *takes forever to click and drag every single item from corpse into backpack* "Eh, I'll sort it later." *dies before sorting, process starts all over* Now it's an easy double click and everything is (mostly) back where you put it! Were you playing back when they had Power Hour? Ahhh, those were the days. I remember when insurance started and people were so happy that important things would return to them if they died. And I remember when collectible things were indeed something worth collecting, and you could actually keep track of what was new and when it was introduced, etc.. Now there are SO many 'collectible' or 'rare' items no one can keep up, so how can you tell if it's really worth collecting? YES! Power Hour was awesome! My Dad had a ginormous diamond from an old school event before T2A came out. It wasn't named anything special, though, so when duping came around and other EMs started using the same graphics the diamond lost all value besides our knowledge of where it came from. I feel like the market is too saturated with silly collectibles. I miss when an item actually had a history to it. It's what made UO so awesome. Each character and item and house was a definite mark on Britannia and its history. Remember the event with Lady Dawn where players could help her kill Blackthorne? I remember participating in that event and it felt so awesome that we could be a part of UO history! It was either in early AoS or right before AoS came out. I think I remember that event. I don't know if I participated. Hubby and his friend (who got us hooked on the game to begin with) might have. I remember there was some event, people were supposed to meet at Castle Brit and a sort of guard would be formed, with those characters receiving special sashes to wear. My friend and I were hanging out at the castle waiting, chitchatting, anxious to get sashes. Ty logged on showed up at the castle and got a sash about 2 seconds after it started, and we...who had been waiting and WANTING...never got any!! Ohhhh, we gave him crap for that!